If news media is to be believed, America is currently besieged by a state of nearly intractable divisiveness that some believe may be signaling the brink of the country’s self-destruction. But even this state of divisiveness is divisive; many will claim the country is no more divisive than it’s ever been. But regardless of where your beliefs lie, one of the personalities at the center of this divisiveness is political operative—and former documentary producer/director/distributor—Stephen K. Bannon. And, like a divisiveness lightening rod, Bannon is currently the subject of two documentaries, about which critics have been divisive as to their presentation of the man and his ideas. 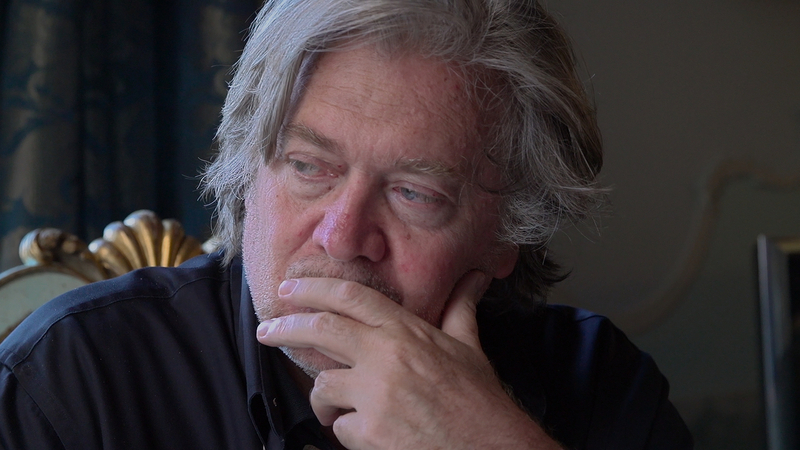 The first to hit the festival circuit, late last year, Errol Morris' American Dharma, delivers a conversation between the acclaimed filmmaker and Bannon, and has been deemed so controversial, by some who claim it serves merely as a platform for Bannon, that the film has yet to find distribution. 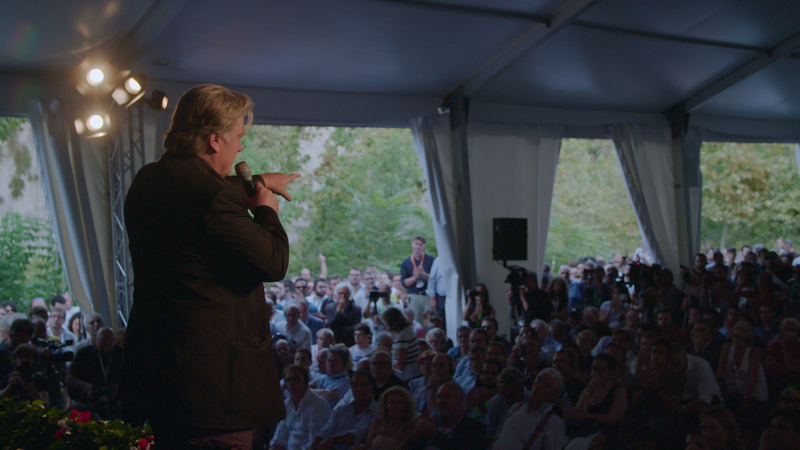 The second, opening March 29 through Magnolia Pictures, is The Brink, from director Alison Klayman (Take Your Pills; Ai Weiwei: Never Sorry) and producer Marie Therese Guirgis (On Her Shoulders; Author: The JT Leroy Story), which has taken a cinema vérité approach that also hopes to demystify Bannon. While most people first heard Bannon's name as head of Breitbart News, or later, as chairman of Donald Trump's presidential campaign, the man has had a long and varied life to date. He grew up in 1960s Virginia, in a typical Irish Catholic working-class family of Kennedy Democrats. He received a bachelor's degree in urban planning, and then served in the Navy for seven years. It was there, in 1980, while serving in the Persian Gulf and playing a role in the Iran hostage crisis, he has said that President Jimmy Carter's failed attempt to rescue the hostages is what turned him from Democrat to Republican. Returning to public life, he earned an MBA from Harvard Business School and went to work at investment giant Goldman Sachs. After a few years, he left Goldman and became a partner in a new investment firm, specializing in the media industry. His company negotiated the sale of Castle Rock from Westinghouse to CNN, and as part of the deal, he received a stake in several of Castle Rock's properties, including Seinfeld (from which he still receives residuals). In the early 1990s, he was hired to run the bizarre environmental experiment Biosphere 2 in Arizona. He also became a Hollywood player, producing The Indian Runner, written and directed by Sean Penn. In 2003, he became head of Wellspring Media, a film distribution company. Under his leadership, the company released a range of indie films, including documentaries such as Werner Herzog's The White Diamond, Jonathan Caouette's Tarnation, Steve James' Reel Paradise, and Larry Elder's Michael & Me, a libertarian response to Michael Moore's Bowling for Columbine. It was during his tenure at Wellspring that The Brink's producer, Marie Therese Guirgis, first met and worked under Bannon. Guirgis stayed in touch with Bannon over the years, remaining friendly but arguing more and more about politics as she saw him taking an extreme turn to the right. There was less and less contact, until he began working with then-candidate Donald Trump and she decided to shoot him an email expressing her “shock, anger and disgust.” Surprisingly, he responded. They continued communicating, and when Bannon joined Trump in the White House, it occurred to her that perhaps she could convince him to let her make a documentary about him that “hopefully would not only strip away the mythic media narrative that was so empowering to him but also allow us to better understand the larger political force of which he is a part,” she says. After several rejections, Bannon eventually agreed to participate in the documentary. Guirgis knew three things going forward—one, it needed to be in a cinema verité style; two, she wanted to deliver the fairest portrait of Bannon she could; and three, she wanted Alison Klayman to helm it. The two had previously worked together on the 2015 short documentary The 100 Years Show. Klayman was game from the get-go, but first wanted to meet with Bannon before deciding to spend what would be a year of her life embedded with such a controversial figure. The two women also agreed that if they weren't allowed full access to Bannon, they wouldn't go forward with the project. And so, in September 2017, she met Bannon for the first time. He agreed to their terms for full access, and Klayman was in—although, as we see in the film, there were moments when Bannon had her turn off the camera, or when she was not allowed into some meetings. In this upside-down world the two found themselves in, the question begs if they ever felt themselves questioning their own worldview? And, to be clear, she doesn't see Trump supporters as sheep either. Trying to make a film about a divisive subject in divisive times and wanting to be fair in one’s approach seems an almost impossible task. In choosing to take on such a task, what is one's responsibility as a filmmaker? Is it possible to make a film without bringing in too much of your own perspective so as not to be seen as fair? Is it possible to create a balancing act between the filmmaker’s and the subject's perspective without the film being seen as propaganda for either? And even if you do succeed, can you get people to possibly break rank from their entrenched camps, to consider a fair approach and see the film? These were questions Klayman and Guirgis confronted at every stage of the process. “The question becomes, 'What's too much of a perspective? '” Klayman says. “To me, it's a movie about someone who makes propaganda and says propaganda is a good thing. And I do draw a line that I don't make propaganda. Yet I'm still thrown by the idea of how can you not have too much of a perspective. Because he's someone who has a complete worldview, and I think the way that you engage with that is to not underestimate that and make sure you're not being manipulated. One of the ways is to stand firm with understanding who you are. This is as much of a personal exploration for me, and a personal work. And so what are the choices I have to make? This is my film, not Steve Bannon's film. It was important to me, in terms of the choices I made, to underscore for the audience that there is a point of view. I think it's okay to embrace that. Guirgis concurs. “I think this film is in the grey area—which is actually what I set out when I wanted to make this film. The film itself is not propaganda, and I don't think it's trying to redeem him. I had a lot of thoughts, a lot of opinions, a lot of hopes for this film, but it was not my position to impose those on Alison, nor would it have been smart for me to do that. She needed to go on this journey herself. And when I watched the first assemblage, I saw she came to the same sort of—not conclusions, but the same questions, the same conversations, the same realizations. I think it's a very full depiction of him. I know him, both good and bad. And a lot of the ‘good’ about his personality was missing from news media depictions. I don't think we saw that this is a man who can be extremely charming, who is charismatic, who has a self-deprecating humor that he actually uses to his advantage and as a tool. I didn't want it to be shown as a way of being nice to him, but I thought it was important that people get the full 360 degrees. The film begins with Bannon relating an experience he had when visiting the concentration camps in Germany for a film he was directing. It's hard to miss the mischievous twinkle in his eye, which tips us off that he's testing Klayman, who is Jewish, right from the start. He talks about what truly struck him was how it must have been for the architects and designers of the camps, and seems genuinely befuddled by how they could do this work. But she uses this story to deliver the theme of the film, which is an exploration into how humans can seemingly divorce themselves from the moral horror of what they are doing. Klayman follows Bannon from fall 2017 through the 2018 mid-term elections as a one-woman crew. She takes us inside Bannon's organization, a ragtag band of misfits whom he is nearly always berating or complaining about. But mostly, we see a charismatic Bannon, who glides his way from private jets to five-star hotels, meeting with members of the uber-wealthy to fund his idea of a united global league of nationalists (which he's calling “The Movement”), which would comprise such political actors as Britain's Nigel Farage, Hungary's Victor Orban, and members of French, Scandinavian, and Italian right-wing political parties, and at the other end of the economic spectrum, the regular folks whom he self-deprecatingly calls “deplorables.” He identifies with the latter when it works for him. “We needed to make sure that we weren't afraid to show him being funny or affable,” Klayman explains, “but also when he says things like, 'It doesn't matter what your race is or ethnicity, your gender, your religion, your sexual preference. It doesn't matter. Economic nationalism only cares that you are a citizen of this republic.' That's one of the hallmarks of his stump speech. This movie is not 90 minutes unfiltered of his stump speech, but I didn't want to be so afraid to let some of what he's about come through. “I think one of the considerations when you make a film about someone like this is that you're very conscious of the potential responses you are going to get from both sides,” Guirgis adds, “Sometimes Alison and I would have a discussion like, let's say there's a moment she knows Steven is lying, and there were times where I would say, 'It's okay. Let it be there. People will know. Trust the audience.' You can trust that the audience will get to know him through the film and maybe arrive at some of the same conclusions that we have. It's not like every time you have to cut him out because he's lying, or, for example, being friendly, nice and civil to this Black politician—which he would be. I don't believe he was playing to the camera. But that doesn't undermine the policies he promotes that are racist. Ron Deutsch is a contributing editor with Documentary. He has written for many publications including National Geographic, Wired, San Francisco Weekly and The Austin American-Statesman.